Hoover is a highly respected manufacturer of consumer home carpet cleaning machines. The Hoover Power Path Deluxe Carpet Washer FH50951 is a 2014 addition to Hoover’s line of carpet cleaners. This model is designed to be lightweight and easy to use. It cleans adequately well but is not going to have as much cleaning power as Hoover’s regular sized cleaners like the Hoover SteamVac or Power Scrub Deluxe. Nevertheless, people buy this cleaner and love it because it is extremely lightweight and handy, making it an ideal machine for smaller homes, or for use a spot cleaner for everyday spills and stains. If you want to get your carpets as clean as they possibly can be then you’ll need to remember that two heads are better than one, and two sets of DualSpin Brushes are definitely better than a single cleaning brush. Single brush carpet cleaners do just fine, but models with a pair of cleaning brushes just perform better as a deep carpet cleaner. The Hoover Power Path Deluxe weighs just 13.4 pounds without water. This is the lightest carpet cleaner with 6 amps of power on the market today. In comparison, the Bissell ProHeat Essential Carpet Cleaner 8852 also has about 6 amps of power but weighs a good 24 pounds. A wide cleaning nozzle width of 11.75 inches means you’ll spend less time shampooing the exact same area of carpet, something which this carpet washer definitely helps you to achieve. This compares very well with the more powerful Hoover SteamVac with Clean Surge with an 11.25 inch cleaning path. Carpet cleaning is already a time-intensive process, so if you can cut down on then number of cleaning strokes, then it’s just an added bonus. The Hoover Path Deluxe Carpet Washer FH50951 uses a dual water tank system. Users do not need to worry about the hassle of trying to fill clean water into and dump water from a single tank type of set-up. Dual tank systems are preferred by most carpet cleaner machine users. There is 3/4 gallons of clean water storage capacity, for small to mid-sized rooms, users won’t have to make as many trips to fill it back up again. You won’t need to struggle to release cleaning solution when using this carpet shampooer – a simple pull of your fingertip is enough to add some extra Hoover cleaning solution to the mix to combat those old and dried-in stains. The Hoover Power Path Deluxe Carpet Washer FH50951 comes with all the accessories the average householder might need. This includes a standard 8-foot hose, an upholstery cleaning tool for keeping your sofa and curtains sparklingly clean, a stair tool to help you make short work of any stairs. Customers also get a starter 16 oz bottle of Hoover Clean Plus cleaning solution and a mesh storage bag. A generous 20-feet of power cord means you won’t feel tied to any one particular power outlet when cleaning your carpets. You get a 1-year limited warranty when you purchase this Hoover carpet shampooer. The Power Path Deluxe FH50951 weighs in at just over 13 pounds (without water). For a lot of people, pulling a heavy machine back and forth to execute cleaning strokes is not the most fun activity. Most consumer home carpet cleaning machines weigh 20 pounds or more, before water is added. Using the lightweight Power Path Deluxe Carpet Washer than a regular sized carpet cleaner is much easier with its light weight. It also makes users less likely to procrastinate with keeping the carpets clean, and more likely to use and enjoy the value of the machine. This lightweight carpet cleaner’s smaller footprint also makes it much easier to store. A number of product testers have noted that the Hoover Power Path Deluxe Carpet Washer FH50951 does not clean and suction as well as Hoover’s regular sized carpet washers like the Hoover SteamVac or Hoover Max Extract . This is almost agiven as this is a lightweight cleaner. The engineers have designed it to be more compact in size and much lighter in weight. It packs a good punch of cleaning effectiveness, but does not measure up to the superb results that users have come to expect from a classic consumer model like the Hoover SteamVac with Clean Surge F7412-900. If like the updated styling of this machine and do not mind handling a little more weight, the more advanced Hoover Power Path Pro FH51102 (19 lbs) could be a better equipped option. It is a full-powered upright carpet cleaner with 10 amps of power. In addition, the Power Path Pro features both a rotating brushroll and SpinScrub brushes, a cutting edge technological combination. Another factor to note is that the brushing mechanism is different from the Hoover’s proven SpinScrub technology that is incorporated into their regular-sized models. The rotating spin brushes here seem to work better for cleaning and grooming low pile carpets like Berber carpets. For thicker carpets, the Power Path’s rotating spin brushes does not seem to deep clean and loosen dirt as thoroughly as the SpinScrub system. Not only that, the suction power of the Hoover Power Path Deluxe appears less capable than what users have experienced with the Hoover SteamVac. 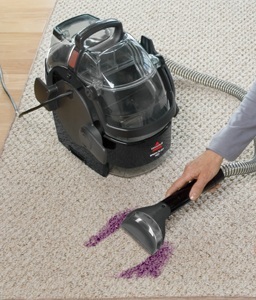 Weaker suction power means that more dirty mixed with water stays in the carpet, and the carpet takes longer to dry. Buyers of this machine should be aware that they will be giving up on some cleaning power to gain the convenience a lightweight cleaner machine. If you are looking at this as the home’s primary carpet cleaner, and you have pets or lots of foot traffic and carpet stains to deal with, you may want to compare this with regular sized models like the Hoover SteamVac or Hoover Power Scrub Deluxe. If weight is important to you, compare this with the Hoover Power Scrub Deluxe FH50150 – the lightest of regular sized machines. 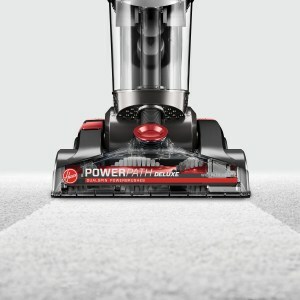 It is about 5 pounds heavier (18.1 vs. 13.4 pounds) than the Hoover Power Path but offers better cleaning performance. 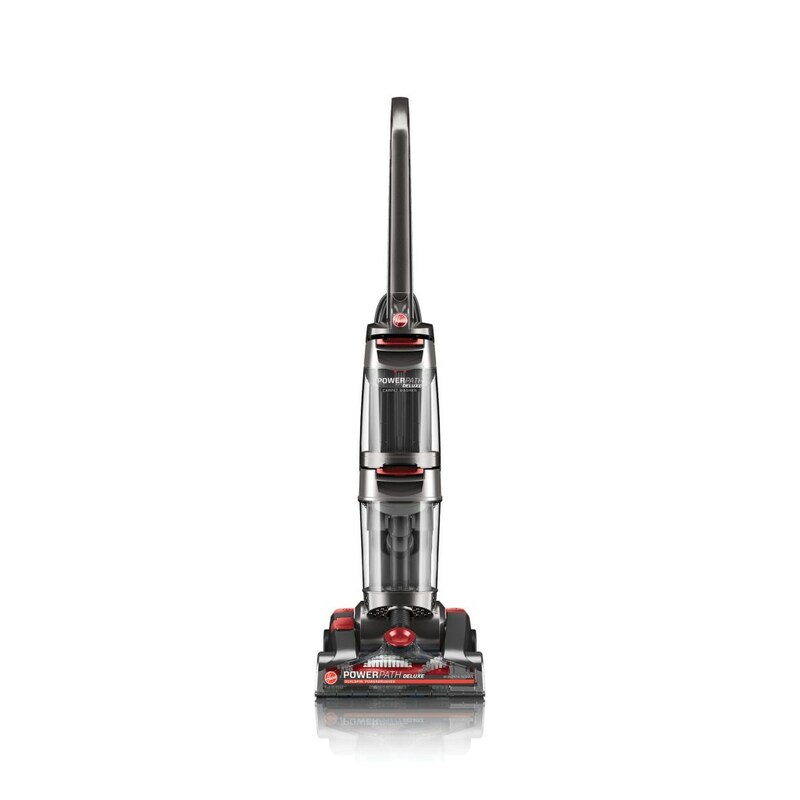 Another choice is the Hoover SteamVac with Clean Surge F5914-900, which is roughly 7 pounds heavier (20 vs. 13.4 pounds). The Power Path Deluxe Carpet Washer FH50951 features dual water tanks – one to fill with clean water, and then the second used to store the dirty water which is sucked back up from your carpet. Although a smaller sized model, the tanks can still accommodate a 3/4 gallon capacity. This means users won’t have to spend very much time going backwards and forwards to your sink to fill it or empty it. A 3/4 gallon sized tank also means less weight than regular 1 gallon sized tanks, as users will not need to push around as much water. Everything about this carpet shampooer is easy to use, and this starts from the moment you have to assemble it, to actually cleaning your carpets. The smaller size of this cleaner also means users find it easy to maneuver, and its light weight also means it’s easy to use on any stairs. Users can even control the amount of solution you apply to your carpet with tons of precision thanks to the fingertip control on this shampooer. The Hoover Power Path Deluxe Carpet Washer FH50951 certainly looks great in terms of specifications on paper when compared to other top lightweight cleaners by Bissell. For example, it has 6 amps of power compared to Bissell’s popular lightweight carpet cleaners like the 47B2 and 40N2 with 3 amps. 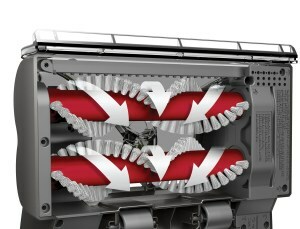 It also has two brush rolls compared to the single brush roll in the Bissell ReadyClean PowerBrush Carpet Cleaner 47B2. In real life, user satisfaction and popularity has not been as stellar, as you will read below. The Hoover Power Path Deluxe seems to have a noticeable volume of user complaints. While early reviews for this machine were good, more and more customers complained of problems after repeated use. Some customers observed smoke, melting parts and broken belts, issues that could be related to the belt tensioner running too tight or malfunctioning. Please be very, very careful if you use this machine, as too much heat can be dangerous. If you are looking for a good lightweight machine, also check out the more popular Bissell ReadyClean PowerBrush Carpet Cleaner 47B2 or the Bissell ReadyClean PowerBrush Carpet Cleaner 40N7. On Hoover.com, some consumers who have purchased the machine indicated that they had problems with it. As of Oct 14, 2015, there were 50 user reviews, and 37 of them gave a low 1 out of 5 star rating (see reviews)! Please only use Hoover-branded carpet shampoos in this and other Hoover carpet cleaners. Failing to do so could cause damage to the machine, and could void the warranty. Popular solutions bought with this cleaner include the Hoover Platinum Collection Pet Plus and Hoover 2X ProPlus Professional Strength Carpet Cleaner solutions. Should You Buy The Hoover Power Path Deluxe Carpet Washer FH50951? The Hoover Power Path Deluxe is light, convenient and easy to use, making the somewhat dreaded task of carpet cleaning pleasant and even fun. It is designed to be lightweight and cleans sufficiently well, but does not have the cleaning power of Hoover’s regular sized machines (like the classic Hoover SteamVac). For a more powerful regular sized deep carpet cleaner, the lightest available is the Hoover Power Scrub Deluxe FH50150 which weighs 18.1 pounds, 5 pounds more than the Hoover Power Path. The Hoover Power Path Deluxe Carpet Washer FH50951 is a lightweight carpet cleaner that cleans carpets adequately well. Due to the level of user complaints, we are hesitant to recommend this model. If you don’t mind the risk, this Hoover carpet washer works best for smaller homes or for spot cleaning of small areas and rooms, as well as for homes with lesser carpet cleaning demands. It is easy to maneuver, light on the hands, and requires limited storage space. Note sure what to choose? Look through the listings on the Carpetcleaningmachinesreviews.com homepage. You can find regular-grade carpet cleaners, small lightweight upright cleaners and portable cleaner machines. Additionally, we participate in various advertising programs. See Advertising Disclosures page for details.